How does your garden grow? With colorful yarn and a crochet hook! 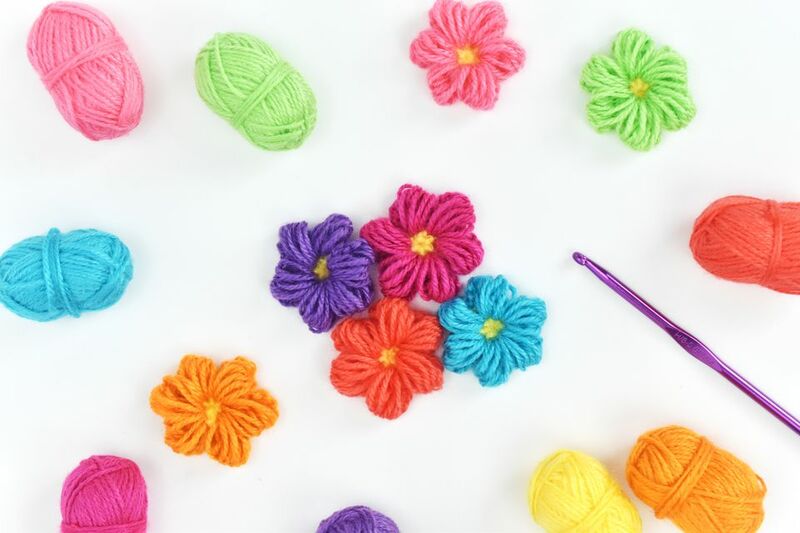 Make these fun puff stitch flowers with leftover bits of yarn and a few simple crochet stitches. 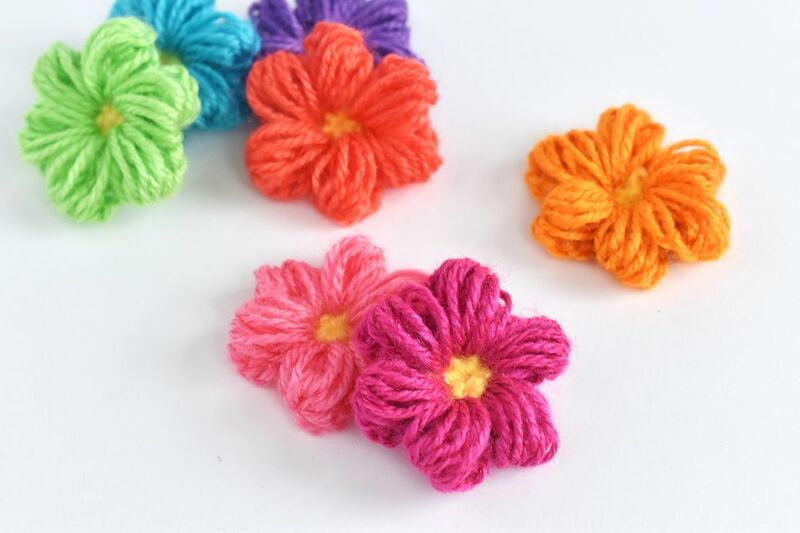 You can use the finished flowers to decorate your crochet projects, craft other types of projects, or even stitch them together to make a thick, puffy floral fabric. Once you make one puff stitch flower, you'll want to make a whole field of them! For this project, we used Lion Brand Yarn Bonbons, which are a DK weight yarn. We paired it with a size H (5mm) hook. This yarn shows the definition of each loop in the puff stitches. Try working with different types of yarn and hook sizes for different looks. You can even mix your yarn types, as long as the weight remains the same. Choose a color for the center of your flower and make a magic circle. After you complete the first chain stitch to start the circle, which counts and one single crochet, work five single crochet stitches. Slip stitch to the first stitch and pull the end to tighten the ring. You should have six stitch loops you can work with around the ring. If you don't want to use a magic circle, you can start with a ring of chain stitches and work single crochet stitches into the center. End off the first color and trim the yarn, leaving a tail. Choose a second color and draw the yarn through one of the single crochet stitches. Tie the yarn to secure it, then draw up a loop. This chain starts each petal on the flower and determines the height of the puff stitch. Work a puff stitch into the same stitch as the chain 3. You can make puff stitches in different sizes. For the flower petals, yarn over, insert the hook, yarn over to draw up a loop five times. Each time you draw up a loop, be sure to draw it up to the height of the chain 3. You should have 11 loops on your hook. Chain 1 to secure the puff stitch, then chain 2 more. These 3 chain stitches finish the stitch and will connect back to the center. Slip stitch in the next single crochet stitch. This completes the first petal and sets you up to start the next. As you work your way around the flower, you can work over the ends of the yarn to secure them. Chain 3 and work a puff stitch into the same stitch. Chain 3 to secure the puff stitch and extend the chain, then slip stitch into the next stitch. Continue following this pattern around the flower. When you finish the sixth flower petal, slip stitch into the first single crochet. End off the yarn. As you work your way around the flower, the center of the magic circle may start to loosen. Pull the end to tighten it again, then weave in the end to secure it. You can also gently pull the yarn ends you worked over to draw everything in, then weave in the remaining ends. Trim the remaining yarn. Flip your work over and admire your finished puff stitch flower! Make a magic circle. SC 5. Sl st to join. End off first color. *Ch 3. Puff st in same st. Ch 3. Sl st in next st.* rep 6 times total. End off second color. Weave in ends. Sew a pin to the back for a fun brooch. Hang them as a garland. Attach them together to form a scarf or even a blanket.